Uber has announced that it is expanding operations beyond the Klang Valley, and will be providing rides in Ipoh very soon. However, it looks like this might only be a trial run as the ride sharing company indicates that the rides will only be offered for the month of February. The press release says that the expansion to Ipoh is due to the upcoming festival season, which we assume means Chinese New Year. We’re not sure if this actually makes the capital of Perak Uber’s fourth city in Malaysia (after Kuala Lumpur, Petaling Jaya, and Shah Alam), but the company is giving it the official label. Interestingly, the Uber rates for Ipoh appear to be different from those in the other Malaysian cities. It looks like the base and minimum fares remain at the old rate of RM1.50; while the time based charge is lower at 20 sen per minute (as opposed to 25 sen per minute). The charge per kilometre remains the same for all four cities at 60 sen per kilometre travelled. Uber has not commented on the difference in rates at the moment. 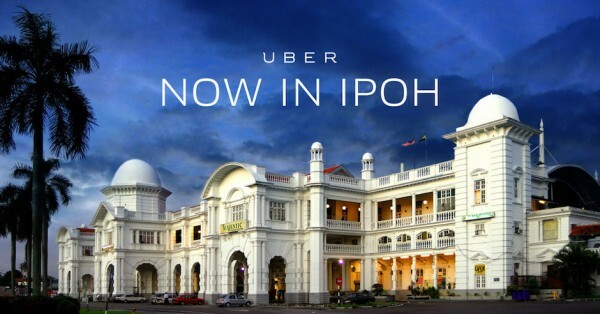 Uber will begin operations in Ipoh on 1 February, and these rides will be available until 28 February. We are not entirely sure what will happen after then, but it is likely that this is just a trial run for the ride sharing company. In any case, those traveling back to Ipoh for Chinese New Year may have an alternative mode of transportation for getting around this holiday season.